"Space travel is the only flight to freedom." Profile: Widely admired for his intelligence, dashing good looks and coolheadedness, Lightspeed is thought to be the model Autobot soldier. But Lightspeed thinks otherwise... for beneath that shiny chrome and steel exterior beats the fuel pump of a tormented soul. Although he appreciates the vital function he fulfills in his ground vehicle mode - processing data and shuttling it to various Autobot bases - he longs to take leave of the surface world and fly. His secret ambition is to explore the vast gulfs of space and uncover the mysteries of the universe. But before he can ask Autobot Command to use its scarce resources to reconstruct him into an interstellar spacecraft, Lightspeed realizes that the Autobots must first win their war against the Decepticons. And until that day, Lightspeed will continue to fight... and to dream. Abilities: In vehicle mode, Lightspeed can accelerate from 0 to 500 mph in 8 seconds, with an average cruising speed of 300 mph. His range is 2,500 miles. He carries two side-mounted, independently targetable plasma blasters. In robot mode, he wields a proton rifle with a magnetic sight that locks on to iron-bearing targets, such as most enemy Decepticons. 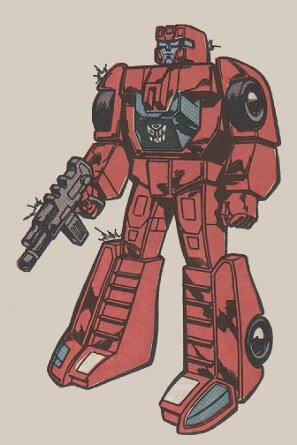 He combines with his fellow Technobots to form the super-robot Computron. Weaknesses: Lightspeed has an allergic reaction to energon, the primary fuel source of all Transformers, and to most other fuels as well, but to a lesser degree. He must always take a special lead sulfide additive when refueling. Otherwise, his engine experiences severe knocking and he'll break out in a rust rash.